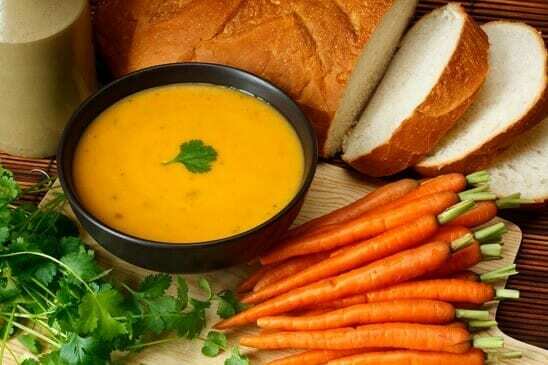 Here is a simple carrot soup recipe using the puree method that i have used for years in my kitchen. When you can make this simple soup, then its possible to add extra flavours. Equipment Needed – Sharp knife, chopping board, blender, saucepan, wooden spoon, sieve, stove. Peel the onion, cut in half and chop into bite size pieces. Chop the top off the carrots and chop into bite size pieces. Add 1 litre of stock – (1 tablespoon of stock cube dissolved in 1 litre of water), the water can be hot or cold. If using cold the stock will not dissolve so just add it all in and it will dissolve in the cooking. Check carrots – when they are super soft its time to puree. (Make sure they are super soft, or they wont pass through the fine sieve. Check for flavour and add more salt and pepper if needed. Seasoning.